May 22, 2014 (Tokyo, Japan) - Japan Display Inc. (President and CEO: Shuichi Otsuka; JDI), a leading global supplier of small- and medium-sized displays, will be taking part in SID DISPLAY WEEK 2014. The event will begin on Sunday, June 1, 2014 (local time) in San Diego, California, USA. At this event, JDI will be delivering presentations at the symposium and exhibiting at booth No. 1332. Based on the concept of "High Resolution World" created by the low temperature poly-silicon (LTPS) technology, JDI will be exhibiting high resolution 4K2K liquid crystal display (LCD) modules for tablets, "WhiteMagic" LCD modules characterized by low power consumption, reflective-type LCD modules, "Pixel Eyes" integrating the touch functionality into the interior of the display (in-cell), etc. JDI will also be delivering three presentations and taking part in four poster sessions at the symposium, which will bring together researchers and engineers involved with displays from around the world. 【Presentation themes at the Symposium】 ( ) shows the program number. 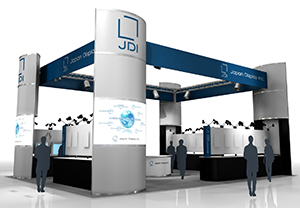 The JDI booth will be divided into sections dedicated to Innovation Vehicle*, smartphones and tablets, automotive applications, medical care and broadcasting, 4K2K, and industrial applications. In each section, a wide array of products will be on exhibition. They include the 10.1-inch 4K2K LCD module, which will come on exhibition for the first time. * Innovation Vehicle serves to bridge our customers' product concepts and our latest technologies. "WhiteMagic", "Pixel Eyes" and "IPS-NEO" are trademarks of Japan Display Inc.